When I dreamed up this shoot I had a vision of two lovers running off together, rebellious, free, untouchable. Them against the world, a runaway bride. I wanted a couple with a bit of edge and along came Sarah and Noah. Their love is infectious and they were the perfect pair to bring this vision to life. Sam who owns Glam By Sam, gave Sarah tousled hair and a bronze smokey eye, she made Sarah look incredible. I thought about what Sarah might wear, I could see a dress with loads of movement, a moto jacket, maybe even a wide brimmed hat? Everything came to life, effortlessly. I wanted the flowers to compliment the muted tones of the desert, while playing into the story, I knew they needed to have an edge. I paired muted sweet peas and toffee roses with peach ranunculus and deep red spray roses. 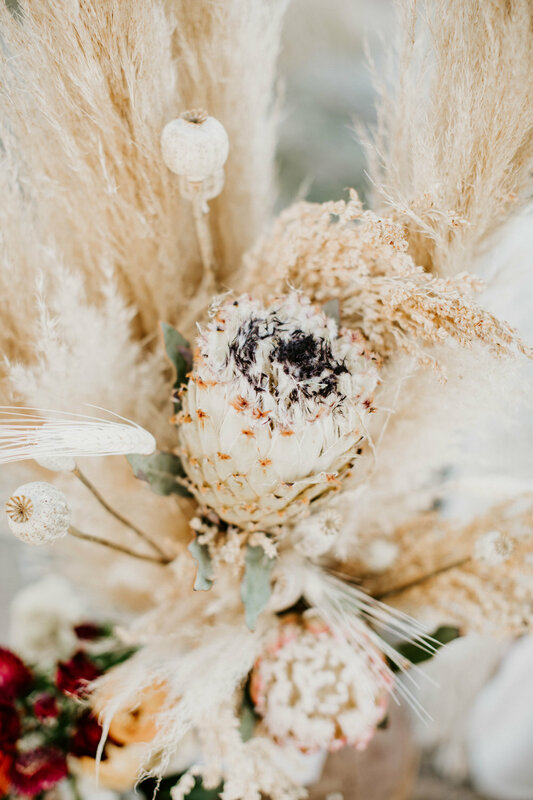 I added in texture with straw flower, pampas grass, poppy pods and protea. Hola Moderna supplied all the rentals, all of their pieces were so pretty! 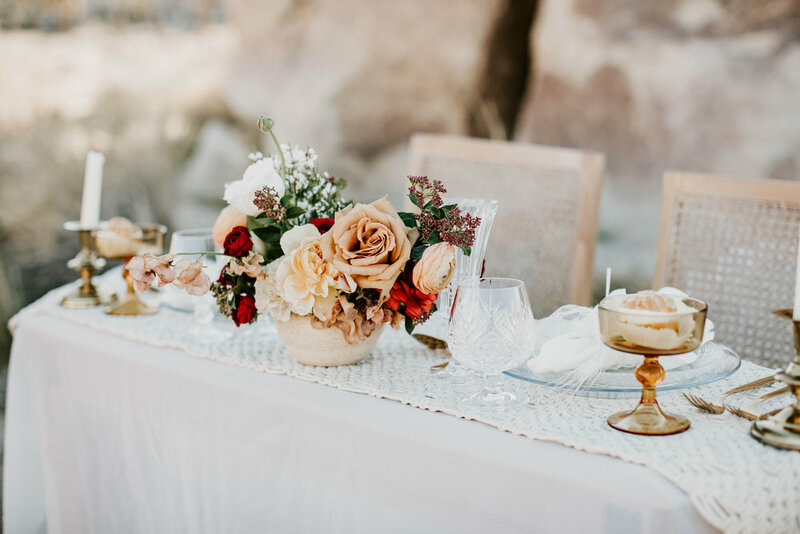 The table was dressed in silk organza and a macrame runner, I love how it turned out. 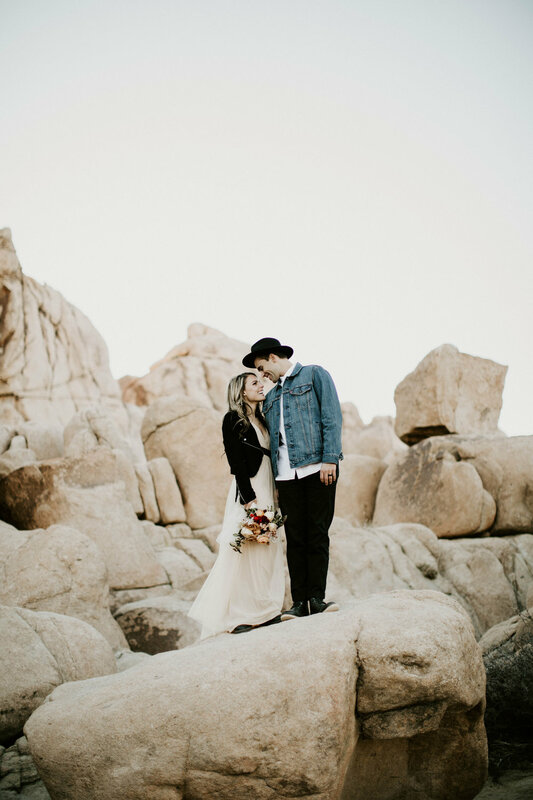 The most perfect photos were captured by Meagan of Meagan Puett Photography. She took literally hundreds of photos and every single one was better than the last. Every photo had such warmth and a sense of intimacy. She told this story perfectly.